Beyond Buenos Aires city -- the Capital Federal, as it's defined -- are the suburban bedroom communities of Gran Buenos Aires and the small towns of the Provincia of Buenos Aires. This past week we explored more of these parts as Salih's visit drew to an end. Wednesday, Dec. 10, the four of us set out for Tigre, a small town northwest of the city where three rivers come together in the Delta to form the giant Rio de la Plata. From our apartment, we first took the subway's D line to Ministro Carranza (90 centavos per ticket), then the commuter train to Mitre Station (another 65 centavos each), and finally the Tren de la Costa (7 pesos each at the residents' rate). With the Argentine peso now trading at around 3.4 to the dollar, the hour-long trip was a real bargain. We arrived too late to take any of the regular boat excursions through the Delta. Instead, we hopped aboard one of the small commuter launches that serve the people who live on the many little islands in the Delta. Folks heading home after work and/or shopping trips were dropped off at individual or neighborhood piers. Waterways provide the only access; no cars here. 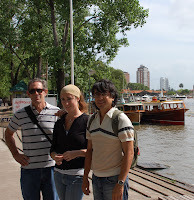 Photos of our visit to Tigre here. The next day we headed further northwest to San Antonio de Areco, best known for its annual gaucho festival in November. We hired our friend Eduardo, a professional driver and man of much knowledge about all things Argentine, to transport us over the 120 kilometer distance. As we rolled from the city through Gran Buenos Aires, the scenery changed from the high rises and great parks of the metropolis to the shopping centers of the suburbs. We knew we had hit the "campo" when the multi-laned autopista abruptly ended at a final toll both, giving way to spreading fields of corn, soy, and wheat interspersed with horse pastures and shady groves of trees. Our first stop, a gas station on the outskirts of San Antonio, included a distinctively Argentine feature: a vending machine selling hot water for mate, the herbal drink of choice here. We headed to the gaucho museum (where Belen immediately bonded with a small dog we named in honor of Salih), then downtown for a lunch of what else but fine Argentine beef, followed up by a stroll through the historic center and then liquid refreshments under a shade tree outside "la Esquina de Merti," a vintage watering hole and restaurant. Next time we stay longer. Photos of San Antonio de Areco here.